﻿ Isle of Man TT blog: TT is go! Isle of Man TT blog: TT is go! I don’t know why the Thruxton BSB round had to be scheduled to clash with the opening of TT 2011 but it certainly played havoc with those teams who compete in the short circuit series and the TT. Don’t get me wrong, Thruxton might have been lashed by miserable weather but there was plenty to savour from a great day’s racing. But for my part there was the disappointment of missing the unique Pre-TT Classic meeting at Billown, which is not only top value in terms of good racing and a chance to ogle some lovely exotic machinery, but a good way to whet the appetite for the TT. And, of course, I missed the first night of TT practice, which is always a bit special seeing all the top guns lining up on the Glencrutchery Road, eager and ready but the strained faces showing first night nerves. Plus it was a mild inconvenience, having to stop overnight at the Birmingham airport hotel before flying out on Tuesday morning. But that was nothing compared to the teams who have done Croft BSB, the North West 200, Thruxton and then dashed overnight to the catch an overnight ferry from Heysham to Douglas – and then, with probably four winks instead of the prerequisite 40, had to prep the bikes ready for Tuesday evening’s practice! Hopefully, next year the scheduling nonsense will be sorted to leave the TT clear of clashes – to ease everyone’s lives. Whinge over, it was pretty refreshing to arrive on the Island greeted by blue skies, sun glinting off the sea – and the weather was still good when practice got underway in the evening. Guy Martin was second quickest at 128.261mph on the Relentless by TAS Suzuki and Cameron Donald did 128.089mph with Wilson Craig Honda. Gary Johnson did 127.7171mph on his first lap with the East Coast Racing/Lincs Lifting Honda. After having an engine problem on the first night, Michael Dunlop’s Street Sweep/PBM Kawasaki ran faultlessly and he clocked 126.300mph. Bruce Anstey had a beaming smile after practice suggesting he had plenty more in hand than his 126.345mph might suggest. Keith Amor didn’t complete a flying lap on the Honda TT Legends bike – stopping at the end of each to make adjustments to get the bike working to suit him. 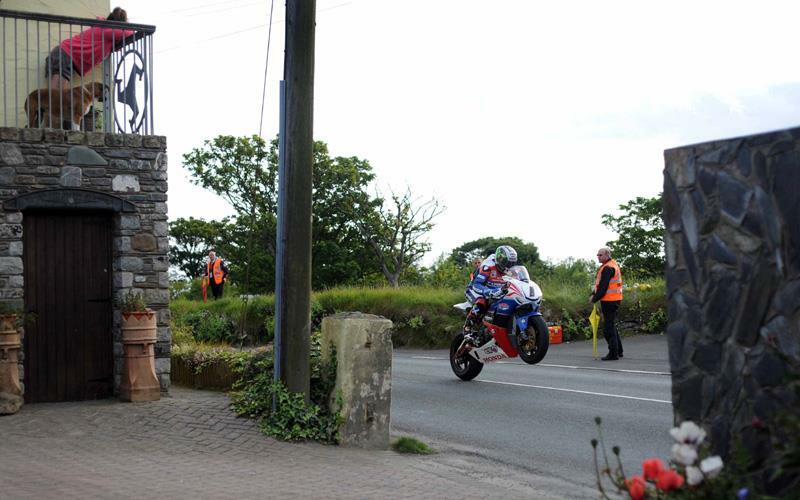 He was seventh quickest ahead of Dan Stewart and William Dunlop. Michael Rutter rounded out the top ten with a 124mph lap on the Riders/Bathams Ducati that he said needed a fair amount of work to get some high speed stability from the v-twin. The official Superstock times weren’t accurate with the top three accredited with their superbike laps times! Bearing that in mind Guy Martin did 125.72, while Michael Dunlop clocked 125.46mph, McGuinness 124.46mph, Donald 124.44mph and Bruce Anstey 124.21mph. Michael Dunlop topped the Supersport class with a lap of 125.46mph on his Street Sweep Yamaha, from Anstey 124.23mph, William Dunlop 120.15mph, Johnson 119.82mph and McGuinness 119.74mph.